Ikebana is a traditional Japanese art of arranging flowers. Each arrangement is made of seasonal flowers and other plant cuttings. 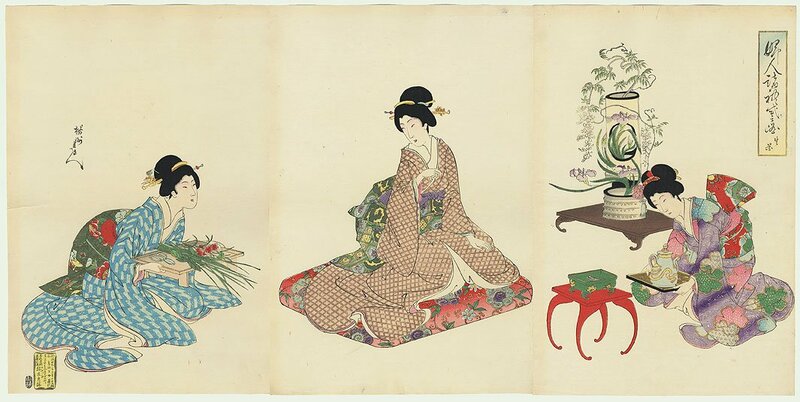 The idea of using flowers as a decoration for the first time came to Japan 1500 years ago. along with Buddhism. With time, the arrangement of flowers became deeply rooted in Japanese life. People arrange flowers at home in a way that embodies the changing seasons. There are currently over 2000 Ikebana schools in Japan. Traditions of each school pass from teachers to students through rigorous training. However, Ikebana is more than just arranging flowers, it must also reflect the creator’s mind. The birthplace of Ikebana was the temple of Choho-ji. It is said that the first flower arrangements was create by a monk from the temple as a offering for the Buddha, and this practice became the basis of Ikeban’s art. In Japan, the skill of arranging flowers has long been a mark of being a cultured person. Ikebana attaches great importance to studying the formal etiquette and promoting self-reflection. When creating Ikebana, we should clean our mind of thoughts, forget about the outside world and completely submit to the arrangement. Rikka is the oldest and most traditional form of Ikebana, which was offered in Buddhist temples. It uses a tall and narrow vase, which is made of bronze and must be symmetrical, because symmetry must be preserved in Buddhist rituals. Each of the elements symbolizes something different. Pine branches symbolize winter and flowers symbolize spring or summer. Rikka presents the changing seasons and is formalized. 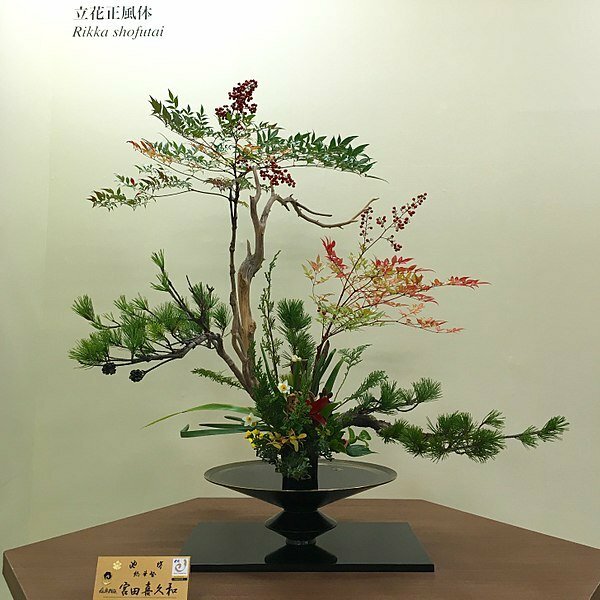 Another Ikebana style called Shoka is a simplified format of the Rikka style, which was used by ordinary people and enabled the popularization of Ikebana. Flowers in Shoka are arranged according to three lines and usually only three types of plants are used. The balance between the height and length of the line is crucial. However, the left and right sides are not in balance. This is purposeful, because this arrangement takes into account the presence of the sun. The flower line on the left indicates that the sun is in the upper left corner. This line of flowers is attracted to the sun, rising towards it. However, the right side is in shadow, so it’s shorter. The vase represents the earth and symbolizes the way plants grow out of the earth, and then grow towards the sun. Shoka also allowed the use of ceramic vessels that had various shapes and did not have to be symmetrical. Arrangement of plants is three times longer than the length of the vase, the left side is twice as long, and the smallest element in Ikebana, for example, the flower is the length of the vase. Such proportions allow you to get the harmony of the composition. Ikebana in the style of Shoka is the decoration of the alcove in a traditional Japanese room. The alcove is used to receive guests, and the flowers presented here express the care of the hosts for their guests. 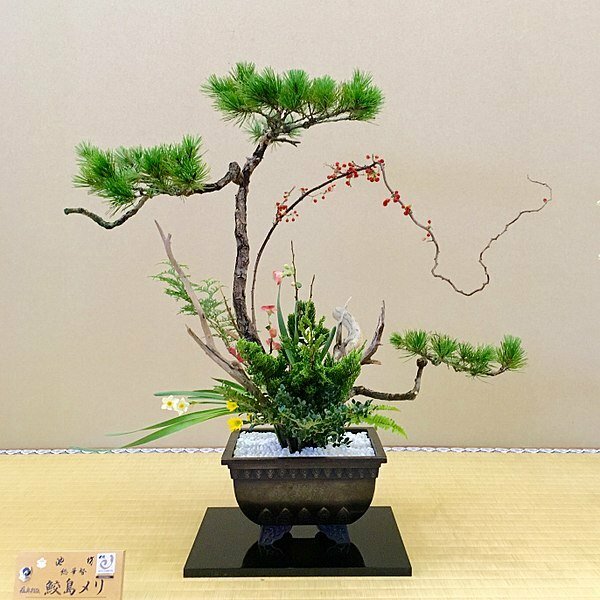 The latest style of Ikebana is Jiyuka, which means arrangement according to the will and aesthetic feeling of the creator. In Jiyuka you also want to present, in the best composition, seasonal flowers and plants, but additionally it is also important to show that there is life in them and they are create by nature. The development of such a free-style Ikebana coincided with the import of western flowers, thanks to which artists had more possibilities. At present, various vessels are created that enable the creation of various arrangements. For example, wood is used, which makes Ikebana unity with the vessel and everything is even more natural and informal. In Ikebana, the composition begins with the selection of the plant, which will be in the central location, and then the rest of the elements are selected. It’s like painting a picture, but with plants and in addition in three dimensions. It is not enough to choose elements with the desired length and colors. They should also be appropriately cut and shaped, for example branches would not be arranged vertically, but spread more towards the sides. There is a proper way to watch and appreciate the Ikebana. It is usually placed in a traditional Japanese room with tatami. You should sit in front of the alcove in which there is Ikebana and bow. Admiring the flowers should begin with the water level and slowly steer your eyes higher and higher, following the flower line and then back towards the vase. Finally, you should bow another time to show your gratitude to the person who created the arrangement. Artists of Ikebana not only arrange flowers, leaves and branches in a vase in an appropriate way, but above all appreciate the beauty of life. They try to express it through the use of materials that are the work of nature and there is life in them. 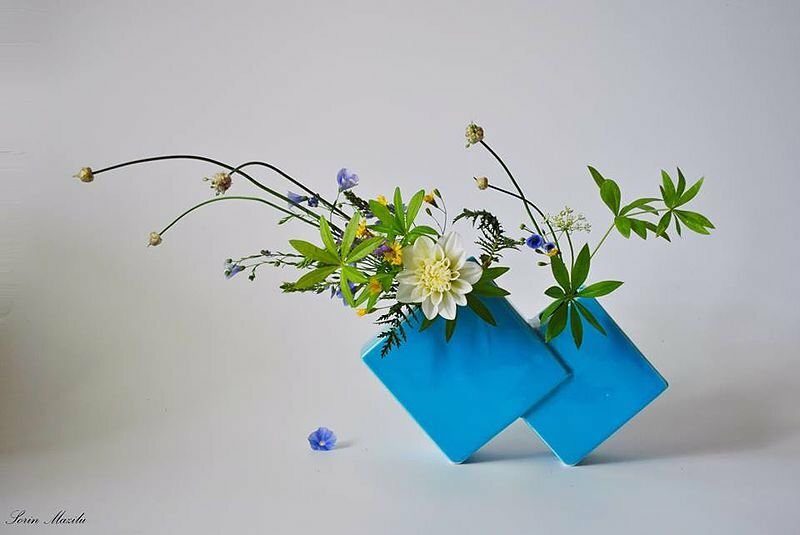 In Ikebana, the idea is to emphasize and bring out their natural beauty.